Broadway In Chicago announced there will be a digital lottery and rush tickets for the musical adaptation of The New York Times bestseller THE LIGHTNING THIEF: THE PERCY JACKSON MUSICAL. 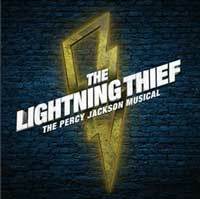 THE LIGHTNING THIEF: THE PERCY JACKSON MUSICAL will play the Oriental Theatre (24 W. Randolph) for a limited one-week engagement January 8-13, 2019. A digital lottery will begin Jan. 7 at 9AM, and twenty-six tickets will be sold for every performance at $25 each. The lottery will happen online only the day before each performance. Seat locations vary per performance. In addition, a limited number of day-of show rush tickets are offered for $39 per ticket. These will be available at all performances of the run for purchase in-person at the Oriental Theatre box office beginning when the box office opens daily. Seat locations vary per performance for the digital lottery and day-of show tickets. -Follow the link "Click here for details and to enter the lottery"
-After payment has been received, patrons can pick up tickets at the Oriental Theatre (24 W. Randolph) no sooner than 30 minutes before show time with a valid photo ID. As a son of Poseidon, Percy Jackson has newly discovered powers he can't control, monsters on his trail, and is on a quest to find Zeus' lightning bolt to prevent a war between the Greek gods. Based on the best-selling novel by Rick Riordan and featuring a thrilling original rock score, THE LIGHTNING THIEF: THE PERCY JACKSON MUSICAL is an action-packed theatrical adventure that has been celebrated by audiences and critics alike.